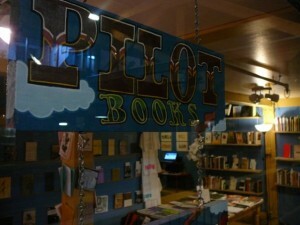 Pilot Books in Seattle, Washington is a place I would very much like to visit someday. "Since June 2009, Pilot Books has been a West Coast epicenter for writers, small press publishers, and literary obscurists of all shades and stripes. We’re volunteer run. Smaller than a breadbox. And we’re obsessed with the weirdo chic art known as indie lit." Learn more about Pilot Books HERE. And if you're in the area, stop in and grab yourself a copy of my novella Grease Stains, Kismet, and Maternal Wisdom. That's right- it's on the west coast now, too. Thanks to Pilot Books for being cool, and, of course, thanks to Pablo D'stair and Brown Paper Publishing for being a little bit crazy.